If you're trying for a job at a corporation that's far away from where you currently live, a telephone interview might be your first introduction to the company as well as their initial impression of you. Because you will be unable to read body language or make a terrific impact appearance-wise, you'll need to rely on some careful planning to ensure that you come across as the perfect candidate for the opening. 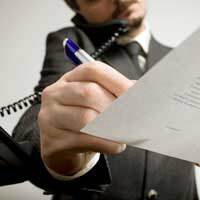 Here are one dozen helpful tips to ensure that your next telephone interview is successful. Have you ever spoken on the phone to someone who was munching on a sandwich or smacking a piece of gum? Besides being annoying, it can also make it difficult to hear what he or she has to say. Never eat during your phone interview, and unless you really need some water, don't drink, either. If you absolutely have to, you can always make an apology and state, "I'm sorry - do you mind if I take a quick drink of water?" Your interviewer will most likely find this both acceptable and courteous. Before your interview begins, make sure to use the restroom. Nothing says, "Don't hire this guy/gal" like the sound of a commode flushing. If you really have to go (as in the case of a stomach virus or urgency you simply cannot ignore), you may have to ask, "I'm sorry… could I please call you back in five minutes? Something urgent has suddenly been brought to my attention." Remember - this is only for use in emergencies. Ah, kids and pets. They are fabulous and sweet, but not when they are in the background while you're trying to discuss business. Your interviewer won't appreciate having to yell over your four year old or barking German shepherd. Even if you have to pay a babysitter or sequester yourself in a closet (yes, it's been done) for the duration of your telephone interview, it's better than seeming rude or unprofessional. Though it can be difficult, try not to let your mind wander during your conversation. By taking notes on a handy sheet of paper (don't type - it's annoying to the person on the other end of the telephone to hear the tap-tap-tap of your keyboard), you'll be able to stay on task and ensure you don't forget to ask something of the person with whom you're speaking. Chances are, your interviewer will be sitting at his or her desk holding a copy of any materials you sent their business. In order to be certain that you can quickly reference those documents, have copies in front of you, too. Consequently, if he or she asks a pertinent question, you can always say, "As you can see on page two of my CV, I was a board member for H2O Agency during which time I served as treasurer as well." Make the telephone interview easy for the person who calls you (or whom you call) by planning a little. Think of everything you'd like to know about the company, position, job title, et cetera. Then, keep a running list of those questions in front of you. As your questions are answered, cross them off; as more pop into your mind, write them down. Though it can be tough, try not to talk over your interviewer. If he or she is saying something, wait silently until you have an opening to speak. Though this can feel a little awkward, it's critical that you don't come across as someone who can't keep him- or herself in control. When you answer a question, try to keep your reply as succinct as possible. Rather than saying the same thing over and over again, say it once and then stop talking. This might feel strange, but it will keep the interview on track and your interviewer will appreciate the way you can get your point across quickly. Even if your interviewer doesn't seem to be paying attention to the clock, you should. In fact, if your interview is scheduled to run thirty minutes and it's been continuing for 40, you could even gently say, "Excuse me. I am greatly enjoying our conversation, but I did want to let you know that we've gone over our proscribed time by 10 minutes. I'm quite willing to keep discussing your business and how I can fit into your company, but I just wanted to let you know in case you have other appointments." This attention to detail will show a high degree of professionalism, and your interview will remember you as someone who was extremely conscientious and polite. If you are going to conduct your telephone interview via cell phone, do so inside. If you're out-of-doors, the rushing wind can interfere with the clarity of your communication, not to mention the various sounds emitted from roadways and neighbors. Though this may not always be possible, it's a good idea not to agree to a telephone interview if you know you'll be at work. Instead, try to schedule any telephone interviews before or after office hours or during a lunch period if at all possible. That way, you won't be "caught" by your present employer or a nosy coworker. After you hang up the phone, don't be surprised if you suddenly remember something you wanted to know. However, unless it's absolutely critical (and it probably isn't, or you would have written it down during the discussion or prepared for it beforehand), don't call back. Just let it go and cross your fingers; hopefully, you'll get another call soon asking for a face-to-face interview or even offering you the big job!